Roasting meat also requires proper resting time so the juices and flavor won’t run out all over your plate! So this recipe may seem a bit complicated, but it makes perfect sense to use the same pan you roasted your meat in for your veggies, while your meat is resting. You don’t waste any of that wonderful flavor from browning your meat and you only have one pan to wash! It’s a win/win! Heat an oven proof skillet with 2 tablespoons olive oil. Season pork loins with sea salt and pepper. Sear pork on all sides, about 12 minutes total. Deglaze pan with white wine and place in oven to finish cooking for 15-20 minutes until it reaches an internal temperature of 150. Remove pork loins onto platter, cover loosely with foil and allow meat to rest. In the same skillet, add your butter, garlic, leeks and mushrooms. Saute until tender about 7 minutes. Add sage and season with salt and pepper. Add an additional pad of butter if needed. 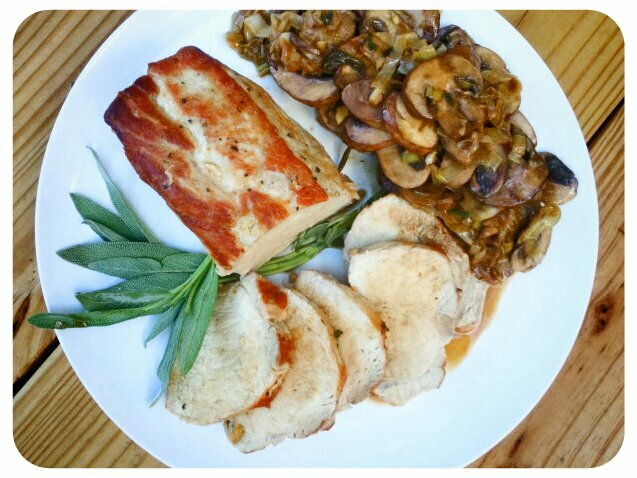 Slice pork loins into 1/2 inch thick slices and serve with the sauteed mushrooms and leeks.